With the Countryman Crossover, Mini is shaking off the cutesy image they’ve acquired with the new Cooper and putting on a sporty and macho face. First we had the Mini Countryman WRC, and now this, the MINI ALL4 Racing which is a tough 4×4 off-roader built by Monster energy X-Raid team for 2011 Dakar Rally. The ALL4 will be using the same 315-hp and 523 lb-ft of torque turbo-diesel engine from X-Raid’s BMW X3-CC crosscountry racer, and will have its shakedown in France on December 13/14th. It will then be transported by airfreight to South America for final preparations for scrutineering in Buenos Aires at the end of the month. The event starts in Buenos Aires on New Year’s Day and finishes in the Argentine capital on Sunday, January 16th, 2011. For most 4×4 enthusiasts one car company that probably has never been uttered on the trail is the Mini. 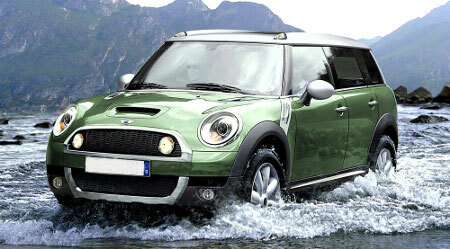 BMW’s Mini is the small, sub compact vehicle that gets great gas mileage and nods from the trendy and stylish. And while the Mini is a well built, popular vehicle for city driving, it is amazing news that the new 4×4 has recently been spotted on the streets of Paris, France where the Paris Motor show is currently going on. It’s incredible, but true, the new Mini 4×4, called the Crossman is being seriously considered as a production vehicle by Mini. The vehicle was spotted outside the Paris Motor show and surprisingly looked extremely interesting. While the Mini Crossman keeps its signature small size, the vehicle looks very beefy and the body is jacked up nicely creating an aggressive stance. In addition, some of the styling cues were the swept back lights, 5 doors (one door which is the hatchback, swings up) and larger tires made for the trail. The New Mini 4×4 Crossman seats four (sorry, there is no super cab option) and it is said that each chair will be able to tilt and slide making it easier to enter and exit the vehicle. Will the Mini 4×4 Crossman be Available in 2010? From what we are hearing, Mini is trying to get this concept car into production by 2010. While price and other specifics are still not set in stone, it looks as though the engine will be shared with the standard hatchback that is available. While many 4×4 enthusiasts will laugh at the Mini, for those that are able to just imagine what a beast this Mini can be, there is a definite anticipation for more details about this 4×4 to emerge. Truck Differential Gaskets: Provide Protection to Your Truck!